There is plenty going on over the next few months on the running front so here’s a number of dates for your running club diary. The Cross Country and Border League races are now underway, with a great turn-out yesterday at Chrisleton for the first Border League. The Border League races are 5-6 miles and mainly on roads or good trails. The cross country races are a similar distance, all off road with as much mud and water as possible! They are great fun and well worth doing. If you are new to them, try the Sunday league series as they tend to be more informal with a whole mixture of abilities and speeds. There are still some Road and Fell Counters left to complete the 2014 championship season. Unfortunately some of the races clash, so some days there is even a choice of which race to do! Next year we will try and avoid as many clashes, but sometimes it just cannot be helped as we participate in several leagues. If you have not tried a Fell Race before then the Dave Staff Memorial Race is an ideal one to debut, as its fairly short and does not go too high on the Lancashire Moors around Darwen. Here is a quick update one what is coming up. The green events are Helsby Running Club counters, red Christmas events you may be interested in doing and blue are Four Villages related events. A number of our runners are sporting moustaches for November to help raise money for the Movember Foundation for prostate cancer http://uk.movember.com/. Jane Bishop has kindly volunteered to make her usual selection of yummy cakes for both Sunday’s Cross Country Race and the Fell race and asks for donations to be made that day towards this good cause. So please come along and support these races if you can!! Wed 3rd Dec Talk after our club training run, with chip buttie supper, in the bar at the Club House. From “Couch Potato to Marathon Runner” by our own Claire Louise Miller. Sun 7th Dec Final Fell Counter, Cardington Cracker, 9m, 800m, 11 am; a tough but rewarding one around the Shrophsire Hills of the Long Mynd. Wed 17th Dec Christmas Club Handicap followed by a homemade soup & mince pie supper. Meet at the club at 6:30 pm (Xmas dress optional!). We will have a warm up, then gather at the start near Tesco for our 3.3 mile dash to Godscroft Lane and back with handicap starts (which I am currently compiling!!). Please bring a wrapped Xmas present to the value of £5 for the secret Santa prize giving in the bar afterwards. For the supper Lesley & Dave will email soon asking for a number of volunteers to bring big pans of soup to warm us all up davidfeakes1234@btinternet.com ) NOTE we have three club entries for the London Marathon so please bring along your London Marathon rejection slips and we will draw for the three places this evening. Fri 26th Dec Goshawk Run 12:00 pm, an informal 3 mile run from the Goshawk pub in Mouldsworth. Just turn up and run. Its also the Race the Walls in Chester, but you probably need to pre-enter http://www.westcheshireac.co.uk/roadracing/RoundtheWalls. Sat 17th Jan Four Villages Set up Morning, 9 am at the club. Very important so please come along and help set up this year’s race. Many hands make light work and it’s great fun too seeing what lies behind organising such a large race. Depending on the state of the club house we may organise a working/clearing up party the Saturday morning before too. Sat 18th Jan Essar Four Villages Half Marathon 11 am. Entries are now over 2,000 with a limit of 2,250. Whether you run or help on the day let’s hope it’s a brilliant race day, proudly organised by race director Gareth Boyd and the whole of Helsby Running Club. Volunteers are required for marshalling, at the start and finish and Sports Club. If you can help or nominate someone to help (if you are running it) please let Dave Feakes (marshalls) davidfeakes1234@btinternet.com or Gareth garethboyd@financialrecruitment.biz know. Sat 24th Jan Helsby Running Club Xmas Party. We thought this year, that with an already busy Dec and Jan, it would be good to hold a post Four Villages Saturday Night Xmas Party, at Helsby Community Sports Club, with Chris Igoe’s famous disco and a buffet supper, bring a salad or starter, more details nearer the time from Dave & Lesley. Hope to see you out and about running on the run up to Xmas, a happy Xmas and New Year when it comes and hope to see you at many of these events into 2015! Saturdays Parkruns saw Helsby runners at Delamere and Ellesmere Port. Colin Bishop secured second place at Delamere with Emma Barnes getting a PB at the same race. 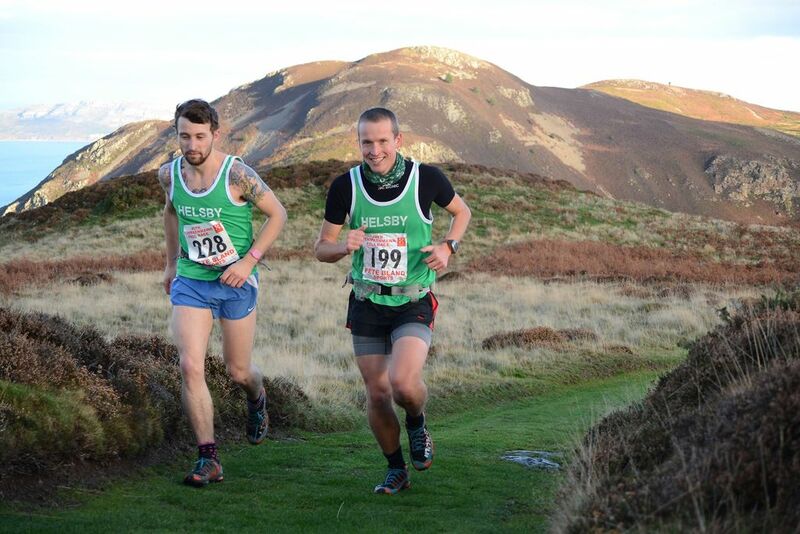 Full results for Helsby runners at both races can be found at the link below. 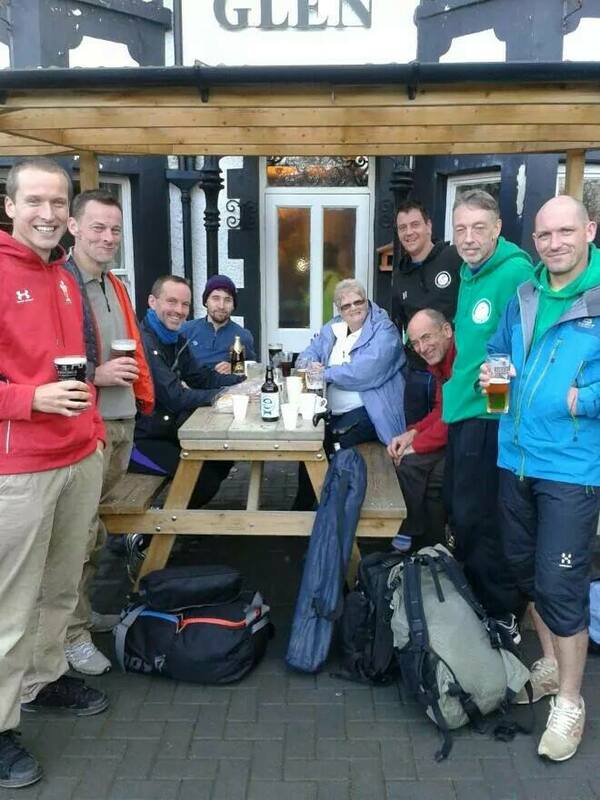 Chris Bayham-Hughes, Jim O’Hara and Max Wainwright journeyed to the Brecon Beacons to attempt the 46 mile ultra. Chris’ report is below. “The line up was a little different this year at what is generally the last big race of the season for me; The Brecon Ultra. My first official ultra back in 2011 (although I had soloed the Sandstone Trail) is ~46 miles of trails ranging from canal tow path, farmers fields, fire road and awkward rocky bridleway to more fields, country lanes and back to the canal tow path… oh, and you do two loops. This year Jim ‘Tap it out’ O’Hara and Max Wainwright joined me – Max only joining us with about 1 week to go due to a drop out from the usual guys I go with. It’s a very sociable ultra and great for beginners as the navigation is very simple and the terrain is forgiving given that it also packs in 5600ft of climb. The first real hill is not really runable but the other two are…. although this also makes it tough as you don’t get a nice walk here and there without feeling guilty! Max had been out doing some last minute panic training with a 13, 16 and 27 miler in the week leading up to the race, but Jimmy and Max headed out together whilst I caught up with some friends and tried to run a more sensible pace for me. Every year now I arrive knackered at the start line for this due to all the other adventures I’ve conspired to pack in leading up to it. Once we left the canal and headed up the views of the beacons were just awesome. Greens combined with browns, bronze and ambers to give a breathtaking visual feast. Added to this we were above the clouds which added a different dimension and uplifted the soul even more. Max and Jimmy passed the half way point in under 3 hours… yes, that’s right, 23 miles and 2800ft of climb with some sections of rough terrain in it, in under 3 hours, so to put this into context, I’d argue this is the equivalent of comfortably dipping under a 3 hour marathon knowing there is a second 23 miles to come – impressive stuff! I had fallen heavily twice but had a solid first lap in roughly 3 hours and 22 minutes, and I started to think that getting back in time to watch the match (Wales international) was possible; by the end of the canal (~3 miles later) I knew it wasn’t! I’d high hopes for the boys though, I knew they were comfortably top 5 and both were going strongly. I started to slip down the field as my year caught up on me. As the field stretched more and more it was impossible to know how close any chasers were or if anybody else ahead was struggling. I knew I wasn’t going to catch anybody so I continued to enjoy the view and plod it out; I won’t lie, I wanted it to be over. Finally arriving at the finish in 14th in ~7:53 I was almost an hour slower than my best on the course (6:56) but I was far more interested in how Max and Jim had done. Congratulations to Helen Gillard who ran her first 10K on Sunday- the Stilton Stumble, completing the undulating course in 60.14. Well done, Helen. Jackie Keasley has passed on the following upcoming dates and races. Lastly, a reminder from Chris Fitzpatrick that the Xmas Christmas do is now Saturday 29th November 7.30pm at Helter Skelter in Frodsham.. Xmas jumpers are compulsory, anyone not conforming to the dress code will be expected to perform a forfeit on the Karaoke. You have been warned!!! 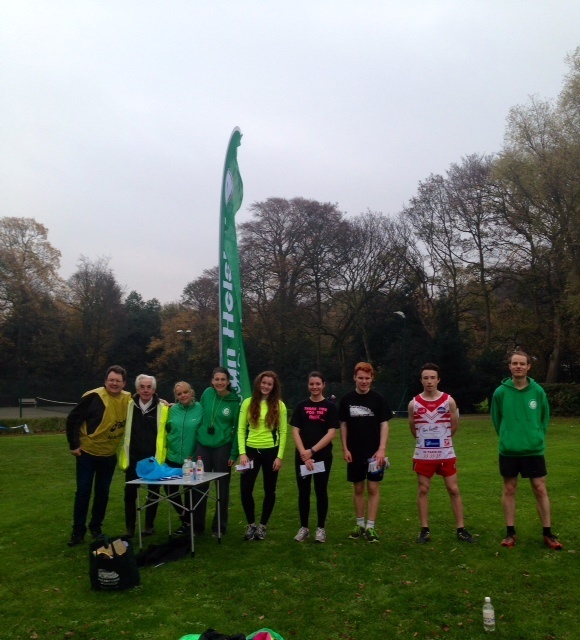 Another busy weekend of running for the Green Army! 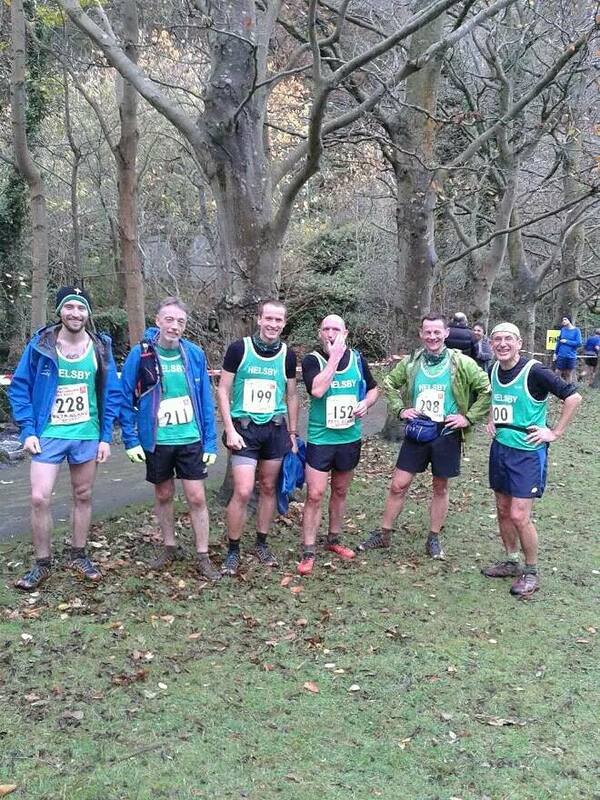 Delamere saw 4 Helsby vests on the start line. 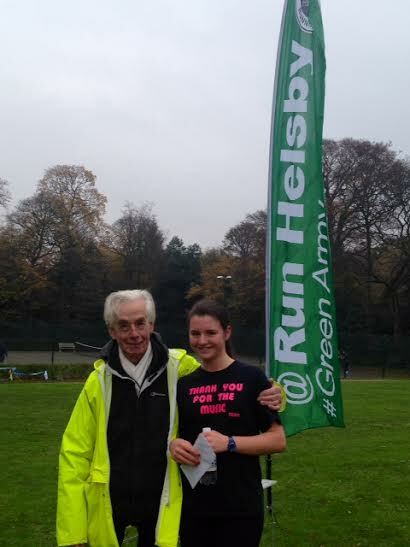 Congratulations to Gareth Boyd for first over the line for Helsby and Rachel Arnold for first Helsby lady home. Also well done to both Gareth and Jackie for doing the double this weekend and attending the Borders League the next day! More on the Borders to follow. I think a special mention should go to our young rising star Harry Peake who stormed around the course in 21:43. Harry has been attending our 16-23 training group and his hard work is starting to show in his race times. One to watch in the future! Warrington saw 2 Helsby runners and another PB from the ever improving Carl Pratt! A great run from Alfie Grady saw him first Helsby finisher and just pipping Carl to the finish line, brilliant running chaps! 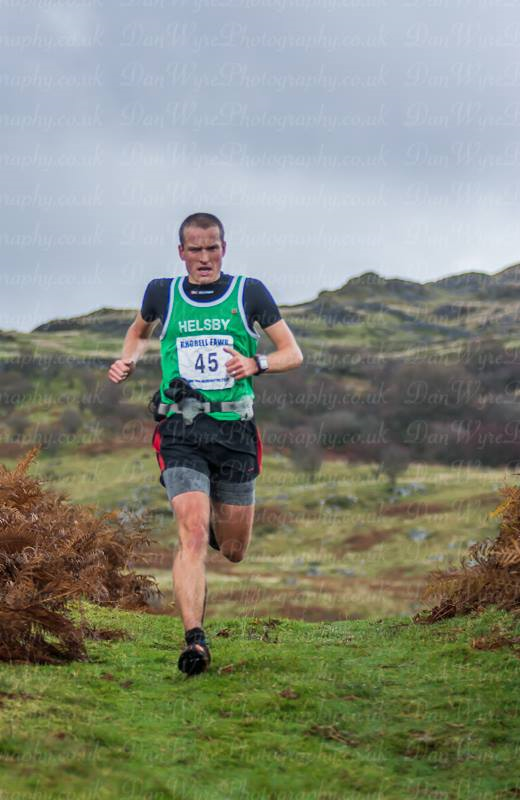 And finally over in Ellesmere Port saw sole Helsby runner Ben Williams with a solid run taking 41st place. Well done Ben. A soggy Saturday in Llanfachreth (near Dolgellau) saw the unstoppable Jimmy O’Hara, Phil Gillard, Jayne Joy and me lining up against some of the finest fell runners in Wales as the Rhobell Fawr race got underway. 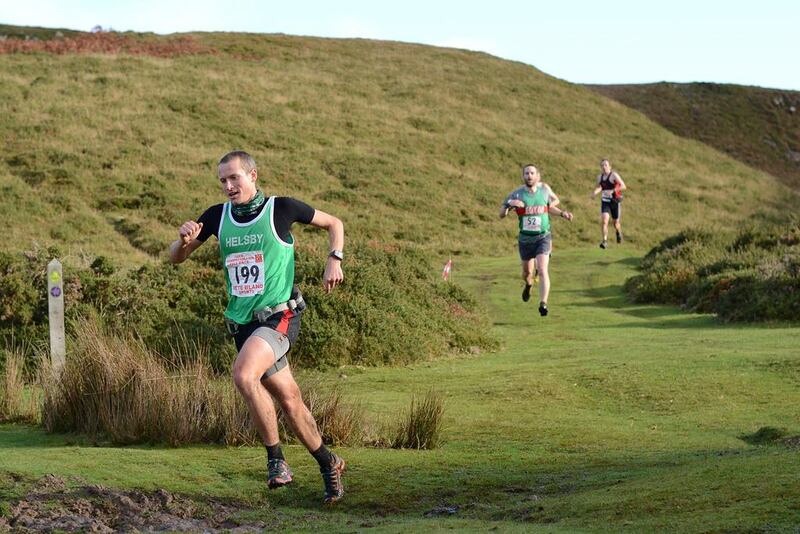 The race was part of two championships (the inov-8 / WFRA Open Welsh Championships and North Wales Series). The course is a very traditional up and down the mountain affair which, coupled with a dry stone wall directly to the top, made navigation a non-issue despite some low hanging cloud. The weather proved a blessing, providing a cooling intermittent drizzle and didn’t impede the simply incredible views on offer across the Meirionnydd. Foel Offrwm looked so inviting I was deeply tempted to extend the race, but by the time I got back I was spanked (both in terms of being physically knackered and metaphorically by Jimmy who has just had an awesome year). Big thanks to Mario and Joe who were both on cheering duties – especially their strategic placement that meant that I couldn’t slack off without being seen for roughly a mile near the finish (I had nobody behind me and I really wanted to – my face in the attached photo is a result of says it all). 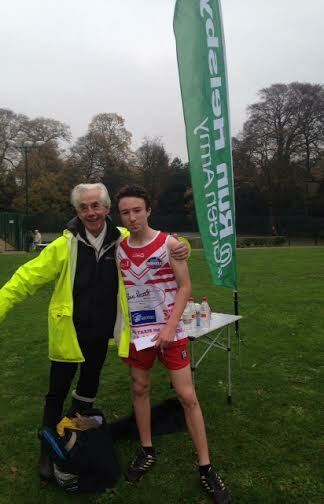 And Jim, with another double weekend of racing, participated in the Manchester Area League cross country in Sherdley Park. Good running from Jim saw him 238th in a competitive field of 389 runners. Well done Jim! Now to the main event of the weekend, the first Borders League race of the year! On Sunday, 35 (yes 35!) 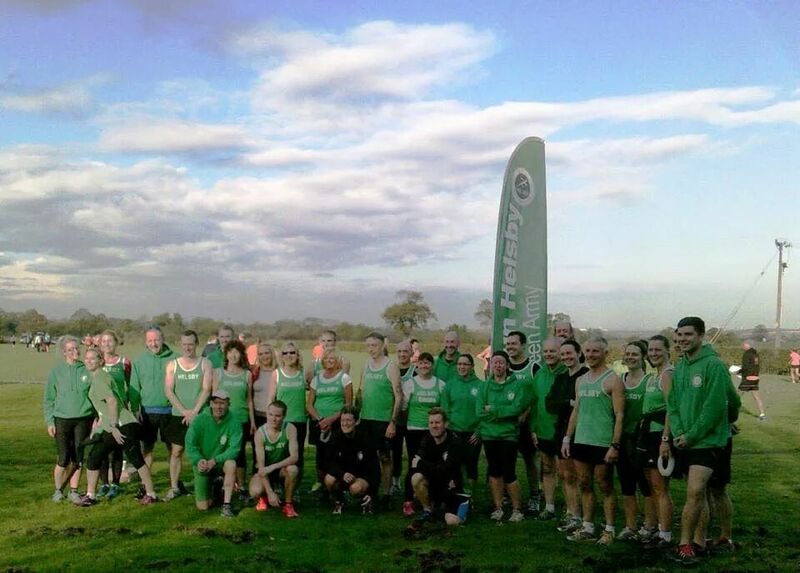 Helsby runners made the journey to Cheshire View in Christleton to do battle with some of the best running clubs Cheshire and North Wales have to offer. It was a tremendous turn out from the club, which must be a record number in recent years! Conditions were race perfect on the undulating 5.75 mile course. The ladies had 14 runners out and delivering a brilliantly executed run saw Joanne Lacking first to the finish for Helsby, also well done to Carol shaw for 3rd in her age group and Jackie 2nd in hers. Great stuff ladies! A special mention should go to all our first timers in this race series, everyone seemed to have a great time with some even managing to smile at the finish line after a tough race! It was great to see so much effort being put in by everyone and it was rewarded with lots of PBs being smashed! The ladies team were 4th on the day, well done everyone! The men had a huge 21 runners out and phenomenal running from Colin Bishop saw him first Helsby runner home, 6th overall and 1st in his age category! But the men were coming in thick and fast and with everybody giving it maximum effort we ensured the mens team topped the 2nd division on the day! A big well done guys, that has to be the best result for a long time! Thank you to our support on the day, CBH (and his 2 boys), Louise, Jane Bishop (who also provided the delicious cookies) and of course Joe and Mario. Don’t forget the next one is on 7th Decemeber in Chester so put it in your diary, Adrian wants 40+ runners next time! That’s all folks, if I have missed any races or results please let me know and I’ll amend the blog accordingly.